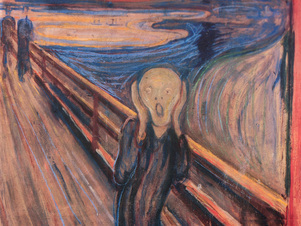 The painting to the left is titled "The Scream", and was created by the Expressionist artist Edvard Munch between 1893 and 1910 and for me was always the best visual description of what anxiety is and what it feels like, it feels as if we are both distorted inside of ourselves and outside of ourselves. Anxiety is defined as a feeling of worry, nervousness, or unease, typically about an imminent event or something with an uncertain outcome. Anxiety can be a very debilitating issue and can impact daily life and people's functioning. Anxiety can happen at the most inopportune times, such as "on the job", "driving a car", or just simply lying in bed at night. It may feel as if a wave of negative power is washing over your body, which can disrupt your breathing, increase your heart rate and can cause headaches and other bodily pains. Anxiety most of the time is thought of as something negative that occurs to us with no prejudice , without remorse, We think anxiety attacks with its own will. However what most people fail to realize is that anxiety is a message that is being conveyed to you, it is as though it were a sign on the road telling you "turn here", "change lanes" or "you're going the wrong way". I have come to view anxiety as a message, a sign that we must listen to, if we embrace our own anxiety and struggle through it, it will teach us something deep about ourselves, something that we need to change. We don't need to change the anxiety, the anxiety is only a message, changing just the sign or the message on the road won't get you to where you are going, you will just become more and more lost, even causing others to become lost as well. When anxiety attacks your life or behaviors needs to be examined to find out where the actual issues lies, that is what must be changed, when you want to deal with a weed, go for the roots.